What is National Simultaneous Story Time? National Simultaneous Storytime ... is organised by the Australian Library and Information Association (ALIA). It is a colourful, vibrant and fun event that aims to promote the value of reading and literacy, using an Australian children's book that explores age appropriate themes and addresses key learning areas of the National Curriculum for Grades 1 to 6. The event receives favourable media coverage, generates a great deal of community interest and is held annually as part of Library and Information Week. When is National Simultaneous Story Time in 2013? 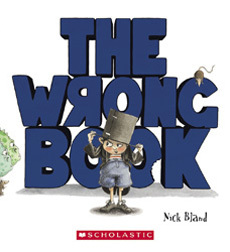 The book chosen for 2013, is Nick Bland's The Wrong Book, published by Scholastic. Why not grab yourself a copy of this delightful children's picture book and read it aloud at 11.00am May 23 with some kids you love? You'll be joining with hundreds of thousands of other Aussies all doing the same activity. Great way to share and promote a love of reading! Here are some fun learning activities you could use to extend the literature experience with The Wrong Book.